In wind farms across North America and Europe, sleek turbines equipped with state-of-the-art technology convert wind energy into electric power. But tucked inside the blades of these feats of modern engineering is a decidedly low-tech core material: balsa wood. Like other manufactured products that use sandwich panel construction to achieve a combination of light weight and strength, turbine blades contain carefully arrayed strips of balsa wood from Ecuador, which provides 95 percent of the world’s supply. For centuries, the fast-growing balsa tree has been prized for its light weight and stiffness relative to density. But balsa wood is expensive and natural variations in the grain can be an impediment to achieving the increasingly precise performance requirements of turbine blades and other sophisticated applications. Materials scientists at Harvard University have created lightweight cellular composites via 3D printing. These fiber-reinforced epoxy composites mimic the structure and performance of balsa wood. Because the fiber fillers align along the printing direction, their local orientation can be exquisitely controlled. These 3D composites may be useful for wind turbine, automotive and aerospace applications, where high stiffness- and strength-to-weight ratios are needed. As turbine makers produce ever-larger blades¾the longest now measure 75 meters, almost matching the wingspan of an Airbus A380 jetliner¾they must be engineered to operate virtually maintenance-free for decades. In order to meet more demanding specifications for precision, weight, and quality consistency, manufacturers are searching for new sandwich construction material options. 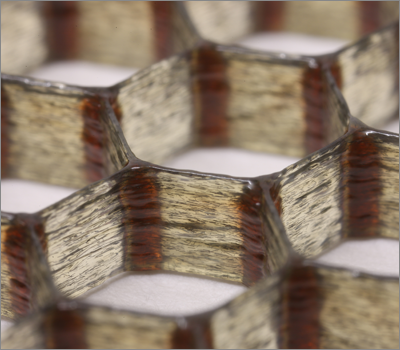 Now, using a cocktail of fiber-reinforced epoxy-based thermosetting resins and 3D extrusion printing techniques, materials scientists at the Harvard School of Engineering and Applied Sciences (SEAS) and the Wyss Institute for Biologically Inspired Engineering have developed cellular composite materials of unprecedented light weight and stiffness. Because of their mechanical properties and the fine-scale control of fabrication, the researchers say these new materials mimic and improve on balsa, and even the best commercial 3D-printed polymers and polymer composites available. Lewis and Brett G. Compton, a former postdoctoral fellow in her group, developed inks of epoxy resins, spiked with viscosity-enhancing nanoclay platelets and a compound called dimethyl methylphosphonate, and then added two types of fillers: tiny silicon carbide “whiskers” and discrete carbon fibers. Key to the versatility of the resulting fiber-filled inks is the ability to control the orientation of the fillers. The direction that the fillers are deposited controls the strength of the materials (think of the ease of splitting a piece of firewood lengthwise versus the relative difficulty of chopping on the perpendicular against the grain). Lewis and Compton have shown that their technique yields cellular composites that are as stiff as wood, 10 to 20 times stiffer than commercial 3D-printed polymers, and twice as strong as the best printed polymer composites. The ability to control the alignment of the fillers means that fabricators can digitally integrate the composition, stiffness, and toughness of an object with its design. The work could have applications in many fields, including the automotive industry where lighter materials hold the key to achieving aggressive government-mandated fuel economy standards. According to one estimate, shedding 110 pounds from each of the 1 billion cars on the road worldwide could produce $40 billion in annual fuel savings. 3D printing has the potential to radically change manufacturing in other ways too. Lewis says the next step will be to test the use of thermosetting resins to create different kinds of architectures, especially by exploiting the technique of blending fillers and precisely aligning them. This could lead to advances not only in structural materials, but also in conductive composites. Previously, Lewis has conducted groundbreaking research in the 3D printing of tissue constructs with vasculature and lithium-ion microbatteries. Primary support for the cellular composites work came from the BASF North American Center for Research on Advanced Materials at Harvard. Additional support was provided by the Materials Research Science and Engineering Center at Harvard, funded by the National Science Foundation (DMR 0820484). About the Harvard School of Engineering and Applied Sciences The Harvard School of Engineering and Applied Sciences (SEAS) serves as the connector and integrator of Harvard’s teaching and research efforts in engineering, applied sciences, and technology. Through collaboration with researchers from all parts of Harvard, other universities, and corporate and foundational partners, we bring discovery and innovation directly to bear on improving human life and society. For more information, visit: http://seas.harvard.edu.